When scheduling posts on your WordPress blog, a few of the right plugins can make this job easier and more manageable. First, use the Dashboard Widget Scheduled Posts plugin. This plugin creates a widget for your WP Dashboard that lists the upcoming posts that are scheduled, but not yet published. 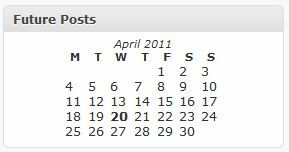 Second, use the Future Posts Calendar plugin. This plugin creates two sets of calendars based on your scheduled posts. One calendar resides in the right column of the New Post page that you’ll see when you’re writing a new post or editing a previous one. The second calendar will be seen by site visitors as it resides in a widget that you can choose to add to a sidebar of your blog. When there are no scheduled posts, the future calendar on the New Post page will have the current date in bold. No future posts scheduled at this time. When at least one post is scheduled for future publication, the future calendar – either on the New Post page or in the blog sidebar – will have differently colored backgrounds depending on the number of posts scheduled for that day. Posts scheduled to appear on the 20th and 21st on the month. 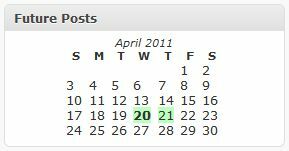 A green background indicates one post, light blue means two posts and blue means three posts scheduled for that day. Clicking a date in the calendar will change the scheduled posting date. Nice feature! If you’re not bothered by editing code, you can alter the PHP file to make a dashboard widget, too. If you want to ad a widget to your dashboard, uncomment the line add_action('wp_dashboard_setup', 'fpc_setup_dashboard_widget'); in the future_calendar.php file. The dashboard widget only shows the date of future posts in the calendar format, so I prefer the Dashboard Widget plugin as it includes post titles. You can add a line for the Theme URI: and Author URI:, if you like. Only the Theme Name: and Template: lines are required, the others are optional. The @import rule indicates the directory of the parent theme and the location of the stylesheet. All you have to do is put in the new css rules below the import line. If modifying the stylesheet doesn’t quite get all the changes you want, realize that you can add any template file to the child-directory and that will over-ride the parent file with the same name. For example, say you want to stick in a block for an advertisement right under the header image. Copy header.php and add a new <div> at the bottom of the page just below <div id=”main”> and stick the ad code in this division. Upload this new header.php into the child-directory and it will replace the one from the parent template. Activate your new child theme and see how it looks! WordPress theme developers have a lot more help in 2011 compared to just a few years ago. With the publishing of the new standard themes and lots more interest in WordPress in general, there is a ton of info for you to soak up. Seek and ye shall find! If you’re just starting to develop your own themes, get a good understanding of the Twenty Ten theme created by the WordPress team. You’ll learn a lot about how to put together your own theme by studying this standard theme that’s included when you download WordPress. One of the advancements in WordPress 3.0 was the introduction of menus. To learn a bit about using the menus in your own theme, get a handle on how they’re used in the Twenty Ten theme. A great menu intro by Justin will start you on your way to understanding menus. If you’re lost and don’t know where to start, look to the WordPress codex for help in getting started in developing themes for WordPress. WordPress 3.0 is here and it’s definitely worth the download. The time you could save in keeping your blogging software up-to-date alone by using WP 3.0 is worth the upgrade. When it comes time to update the WordPress software, including plugins, all it takes is one click! I love the new Twenty Ten theme for its wider view and its modern look and feel. It’s easy to modify, too.